The Shark Bridge opened to the public on April 30, 2015. NEWPORT, Ky. — Newport Aquarium officials have estimated that Sunday, Aug. 16, will be the day the 300,000th guest crosses the world’s first and only Shark Bridge. 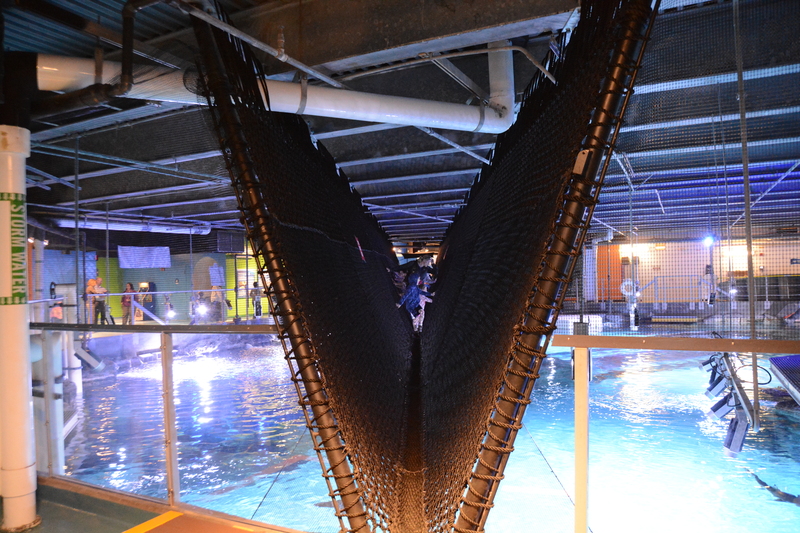 Shark Bridge, a 75-foot-long, V-shaped rope bridge suspended over the open waters of the Surrounded by Sharks exhibit’s 385,000-gallon shark tank, opened on April 30 and has proven to be a hit with the public. The 300,000 crossings of Shark Bridge equates to more than 4,200 miles of distance trekked, or roughly the equivalent of travelling from Cincinnati to Hawaii. Dare to Cross the Shark Bridge at Newport Aquarium. Surrounded by Sharks – Newport Aquarium’s signature exhibit, guests can travel through an 85-foot-long acrylic tunnel inside a 385,000-gallon tank as seven species of sharks – scalloped hammerhead, sand tiger, whitetip, blacktip, zebra, sandbar and nurse – swim over and above. Free Kids Admission Offer Ending Soon: Newport Aquarium is entering the final stretch of its Summer Family Hours promotion, when up to two children (ages 2-12) receive free* admission between 4-7 p.m. Sunday-Friday with the purchase of one full-priced adult ticket. This family-favorite offer runs through Aug. 31, and is available for purchase online only at newportaquarium.com. *This special offer cannot be combined with other discounts or coupons. Last entry to the Aquarium is 6 p.m.